If anyone managed to avoid the fury over this past weekend over the Obama Administration’s Transgender Bathroom decrees http://www2.ed.gov/about/offices/list/ocr/letters/colleague-201605-title-ix-transgender.pdf and this http://www2.ed.gov/about/offices/list/oese/oshs/emergingpractices.pdf , you either have a set of headphones we would all like to acquire or you had a loved one just graduate. Most of the coverage and outrage is directed at imagining the physical intrusiveness of this edict. Occasionally we will get someone stating that this is not the role of the federal government. Reading both those releases though makes it quite clear that we have governments insisting they can command ‘citizens’ to defer to personal perceptions that disregard physical reality. “Ogilvy added: What gets me is how utterly inappropriate our basic economic categories are. We need to recast the concept of property for one thing, because in Marx’s terms property is by definition alienable: that is, unlike your elbow which is you and not yours, property must be transferable to another (alia equals other). I sell you the cow. You got the cow. I don’t have the cow anymore. I sell you information. You got the information. I still have the information. That’s one anomaly. On the list of things the Enlightened forgot to mention was the “rise of psychology in public policy” because “the masses could not be trusted, or, as the historian Ellen Herman put it, summarizing the thinking of this time, ‘mass opinion was dangerous as well as fickle…[It] was a real threat to rational planning.” Another word for such planning is dirigiste and the most effective and hard to observe place to enact such planning would be to go after what the so-called receiver has internalized to guide their perceptions and then interpretations of daily experiences. Well, I am ready to leave Cambridge and whatever is in that air along the Charles River beyond world-class hubris. Let’s get back to why all this is clearly relevant to what the planners want to achieve with these Transgender Edicts. 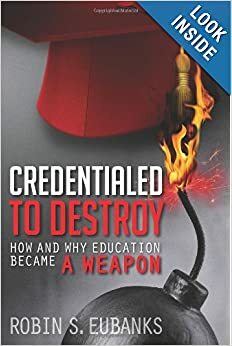 When I wrote my book Credentialed to Destroy , a professor–Ernst Von Glasersfeld and his theory of radical constructivism–figured prominently in what was known in the 90s as the Math Wars and what is really being changed via math classes now. What I learned recently was that Glasersfeld’s theories were a part of cybernetics aspirations and that he had written for a 1984 book called The Invented Reality. Getting at perception and controlling it gives a means to literally change how students will act in the future to alter reality and how they will insist on interacting with others. That’s why the physical reality of anatomical parts and other ways to protect privacy and feelings are not enough for the Civil Rights Advocates. They know, and we should to, that all these theories on how to turn students, principals, and people in general into Marx’s Makers of History ride on using education to control perception. People may not like the bathroom edicts, but is anyone questioning the legitimacy of legally compelling how the world must work simply on the basis of a student’s declared perception of being transgender? In 1979 Glasersfeld and a Viennese prof, John Richards, published a paper called “The Control of Perception and the Construction of Reality.” I am really not speculating here on how crucial controlling individual perception has always been to transformational plans to a planned society that meets all human needs. The transformationalists, showing their fondness for italics, want to shift the purpose of education away from What is the structure of the real world? to a cognitive, internalized emphasis on What is the structure of our experiential world? That is precisely the point of emphasis in the Transgender Edicts: Does the student perceive themselves to be a different gender? No need for psychiatric or medical evidence. A personal declaration will do and must be accepted at face value. Anyone beginning to see why all mandates now push a concept-based, activity-oriented [project-based learning] focus for education for everyone? We need to recognize that the theorists are using education to enact their observation that “the brain’s model of reality, as far as consciousness is concerned, is reality–there is nothing else to perceive.” By manipulating that model of reality through educational practices and then insisting that we must all defer to that manipulated perception of reality, the Transgender Edicts are not just about bathrooms and privacy. The government is continuing to insist that individual perception is a legitimate area for it to manipulate. Then we must all accept the results of the consciousness that was intentionally fostered to believe in the need for change. So ‘standards-based education reforms’ were called on to alter perception to force what was never inevitable at all. Now we get legal decrees to further that same actual mandate and restart the hoped-for transformation. See how this is not really about locker rooms and bathrooms? Anyone wondering if we are about to play an exciting game of cards here at ISC? ACES is an acronym I just created because the phrase Anticipatory Cognitive Embodied Systems is simply too long to keep typing over and over again. Now every time we see the phrases ‘learner-centric education,’ ‘competency-based,’ ‘personalized learning to meet needs and achieve success and full potential,’ or ‘continuous improvement’ as the world’s largest education accreditor used recently http://www.advanc-ed.org/sites/default/files/ESSA%20Call%20to%20Action%20Whitepaper.pdf , we can accurately recognize that political power–local, state governors and legislatures, Congress and the White Houses led by both parties, and international groups–has decreed that students are simply systems to be measured, monitored and manipulated. When that AdvancED White Paper above writes about “a personalized journey of continuous improvement” where the student can be improved by schools “using evidence to pinpoint what must happen in the areas of need identified through the continuous improvement process,” we are back using education and the social sciences to achieve the aims laid out so long ago at those Macy conferences. When the paper talks about social and emotional factors and the “type of additional measures it will use” so that a “school or district must support the development of its students in ways not identified in test scores, but that directly impact student learning and development,” we are actually back to the goals for the future a Macy participant, Larry Frank, laid out in 1951. * Various processes and components of the system are connected and aligned so that they work together as part of a complex whole in support of a common purpose. “* System actors understand and engage each other and the system successfully. Now not only is such individual success not Equitable, but that individual will be using what I am going to call his or her Do-It-Yourself internalized Simplex to decide what to do and how to do it. To perceive what it notices and what guides and motivates its actions and that is thoroughly unacceptable. Saying that forthrightly in the way that Larry Frank did above so long ago might doom all these plans to finally succeed at using education for brain-based social engineering so we get the euphemisms AdvancED and iNacol used or this from 1989 that resonates today in the required ‘systems thinking’ in the Common Core C3 Social Studies Standards, Next Generation Science Standards, and the WIOA economic planning legislation I have covered. A few pages later and consistent with my insistence that it is that internalized Simplex and a desire for individual psychological change to quietly engineer a planned Upravleniye (March 22 post) society that is and has been for decades the real driver of all these reforms, the editors complain that we need to Rethink Patterns of Knowledge in preschool and K-12 because most college students “have already internalized their guiding beliefs and assumptions by the time they enter college.” Try not to faint in horror out there upon reading that statement. So if the purpose of education is now to create minds amenable to political coercion without complaint or even noticing and to lock that in invisibly at a neural level, is there a level of government in a free society where such aims can be regarded as lawful and permissible? Should the accreditors be able to require it working with school boards and their lawyers? Legislatures? Trade groups like the Chamber of Commerce? Is this violation really abhorrent if imposed by the feds but A-OK at a local or state level? See why it is absolutely necessary to confront what is really being targeted for change and why? There is a lot in that paper about the “new capacity based on technological innovation to collect and analyze massive amounts of data on individuals…for building realistic models of individual behavior, learning, and development.” What I want to talk about in this post is the confession about the “invention of a framework that can sustain a science of the individual.” In other words, the offered up theory–Dynamic Systems Theory–need not be factually true if enacting its practices through federal and state law mandates and required classroom implementations that get promotions for Principals and lucrative administrative jobs in central offices like being a District Super. Not true but useful to the Politically Connected. Why am I hyping on these confessions? Because these are the theories adopted for the classroom in the famous 2012 federal “Education for Life and Work” report covered here. http://www.invisibleserfscollar.com/so-now-common-core-rejects-individual-thinking-to-embrace-soviet-psychology-ecology/ It is the theory guiding both the new federal education Every Student Succeeds Act (ESSA) and its companion 2014 federal Upravleniye legislation WIOA. That 2013 Harvard paper above is part of the IMBES–International Mind, Behavior, Education Society work and this 2014 meeting in Ft Worth, Texas shows just how thoroughly what ought to be off-limits in a free society and what used to be known as cybernetics research is rolling right into Texas classrooms, especially, with nary a barrier to entry. In other words, all the hype about instilling grit, resilience, and perseverence is not about creating those qualities. It’s simply as excuse to assess and collect data on what yet another speaker there, Paul van Geert (a name I recognized from systems theorizing) referred to as the simplex system. In a 2014 paper called “The Good, the Bad and the Ugly? The Dynamic Interplay Between Educational Practice, Policy and Research” defined what he meant by a simplex system. He was referring to people and what they have internalized. He used italics for emphasis so so shall I. When the Faux anti-Common Core Narrative makes protecting Personally Identifiable Information the focus of their False Flag coordination it leaves no obstacle to manipulating each student’s simplex system as needed so they are amenable to the Upravleniye vision of the 21st Century. When the same groups keep hyping ‘standardized testing’ they create popular support for a switch to the formative assessments (covered in detail in my book) that are far more effective at altering this individual simplex system than anything that can be put on a multiple-choice test of knowledge. Now by the time I encountered that passage I had read The Scientific Management of Society and recognized the deliberate targeting via assessment and data collection of what we are now calling that internalized simplex. I knew that was what personalized learning was really getting at. I recognized, in other words, the Upravleniye implications if all the mind arson we are encountering and Inapt Metaphors being pushed was actually about Our Steering Keelsmen, in political office or public policy, wanting to create Guiding Fictions because they would be useful in creating that invisible noetic keel. Turned out Vaihinger’s book had recently been brought back into print. A German, writing before the Great War and very concerned about the warlike, aggressive nature of the German people since the 1871 Franco-Prussian War, Vaihinger wanted to dictate and control “those ideas, associations of ideas, and conceptual constructs” which guide an individual’s perception. As if that’s not enough, given the current HOTS mandate in ESSA for annual assessment and the stipulation of CDIs–Core Disciplinary Ideas and CCCs–Cross-Cutting Concepts and Themes in Common Core and its state successors–Vaihinger also wished to limit thought to what was needed for practical action. Sounds just like Competency to me! Let’s go back to that fictional framework Dynamic Systems Theory that can be the foundation of useful classroom practices for guiding, limiting, and predicting thought itself. For motivating desired behaviors in an Upravleniye society where we have become the Governed. The DST authors insisted that there are “compelling theoretical reasons for not putting the cause of developmental change in the frontal lobe.” What if the reasons are that such factually-informed, personally-sculpted Axemaker Minds are simply not amenable to being Governed and will certainly notice all the hoped-for steering and desired false guiding narratives? DST wants to make the individual-in-context the focus because that theory is useful for Social Engineering purposes, not because it is true. It stresses Perceive. Act. Think. as the desired order because it too wants to limit the nature of thought to what is “emergent from the activities of everyday life.” Just like John Goodlad and UNESCO in the 70s for those of you who have read my book. I will end this post with a story told by another prof who wants to use Guiding Fictions and history as about creating scenarios of the future to guide perceptions of what ought to be done now. The belief that the map was accurate caused the soldiers to act and action was the way out. Both in the 90s version of standards-based reforms and now, the very word ‘standards’ is yet another misunderstood, ambivalent term that actually is a euphemism for goals. The 90s New Standards Project and the Common Core now are actually efforts by political power to use a fiction that students and people are merely purposeful organisms. To insist that governments now get to monitor and prescribe what our acceptable Goals can and must be. Just a goal-seeking system whose internalized simplex is subject to tracking and manipulation via education. Why? Because that is what political power and its financial cronies believe will benefit them. When Congress enacted ESSA it required states to annually assess Higher Order Thinking Skills and Understandings for each student in most years. I typically summarize HOTS as the categories and ideas students use to decide what they should do when there is no single correct answer. How they will choose to act in a given situation when faced with uncertainty as to how to best proceed. Anyone think this is coincidental? How about if I add that the author of the 1987 HOTS report, Lauren Resnick, was also co-director of the 90s New Standards Project and on the panel for the Common Core set of student behavioral goals. The real aim is so much clearer when ‘standards’ are described more accurately by their explicit purpose. In his book The Flight from Truth, Jean-Francois Revel noted that most people are indifferent to knowledge. It appears that the so-called ‘conservative’ public policy think tanks have been relying on that truism in constructing their narratives about what is actually going on in education. Only “a tiny minority of human beings,” he wrote, are willing “humbly to explore reality and to expose ourselves to unknown information.” All these redefinitions pushed by public policy entities like Freedom, School Choice, Liberty, Limited Government, Standards, etc. all seem to rely on the truth that “the ideas that interest us most are not new ideas, they are ideas we are accustomed to.” We believe we know what all these terms mean and do not recognize they have become tools of a new political ideology. Needless to say I can relate to all three men and even more to this follow-up statement that “If their cases merit attention, it is because an amateur, by definition, is not backed by any power, by any network of alliances and friendships in the social milieu of the scientists and the university bureaucracy.” Now if Revel were still alive and in the US instead of France, he would obviously now need to add public policy think tanks and especially those tied to the Atlas Network to his list of what it takes to get recognized. I thought about Revel this past week when this paper came out by two researchers determined to make their university degrees front and center. http://www.moagainstcommoncore.com/Patience,Privacy,Power,Politics&PensionsBehindESSA_4JRedits.pdf I wouldn’t say the report is wrong so much as irrelevant to the true purpose of ESSA. The Russian word upravleniye does not have an “entirely satisfactory one-word translation” in English. It follows my mention of ESSA because the word essentially means steering or control of society, the economy, and the people themselves down to the so-called necessary ‘subjective factor’ of human psychology. It seeks to regulate likely activities and the scale of values that motivate and guide likely behavior. The 1976 book from the last post mentioned a 1971 Russian book The Scientific Management of Society that was almost instantaneously translated into English. Having covered a 1976 book by Turchenko in my Credentialed to Destroy, I recognized what such an immediate translation meant. The book arrived Saturday and, just as I feared, it is also the blueprint for ‘steering’ Western countries and their citizens, down to the level of their minds and personalities. “not only are man’s production activities necessarily subject to control, to regulation, but so is his social behaviour. Clearly the effect of controlling values, attitudes, beliefs, emotions, and any other driver of behavior is not news to me. I wrote a book laying precisely that out. What is so unnerving is how closely the 1971 vision fits with what the public policy think tanks are pushing politicians to enact at every level of society today. Let me relate just a few of my personal experiences with think tank deceit so we can appreciate the true impact of what we are dealing with. I thought about it recently as that public policy major and fan of ‘data-driven decision-making’ by governments, House Speaker Paul Ryan, was lecturing Americans and Trump about ‘violence having no place in a campaign,’ while misportraying what was actually said. Ryan immediately made some comment about the rhetoric being a distraction from Republicans pursuing ‘their Agenda.’ He sounded precisely like someone who regards all of us as the Governed and himself as a ruler. Interesting, isn’t it, that the consistent term in English used in that 1971 book for the people in a society that was scientifically managed by governments at all levels was ‘the Governed.’ It turned out to be a necessary component of the shift from capitalism to socialism and finally to communism. Another odd moment for me recently was listening to ‘conservative’ think tank employees insisting that a Hillary Presidency would be preferable to a Trump Presidency and looking at the attendees (especially from the tech companies) at the AEI Sea Island event. Is Trump the wildcard who might not be on board for this planned steering process of Upravleniye and that’s why he must be stopped? Was that why Jeb was the preferred candidate for 2016? Last week I attended a breakfast called “At the Intersection of Education & Aging” that featured Dr Matthew Ladner, of the education-focused think tank and Atlas member, the Foundation for Excellence in Education, that Jeb Bush created in 2008. The presentation hyped the dangers to the state budget from an aging population if the state did not adopt the recommended education changes. Now I have to admit I went partly to hear Dr Ladner who had once responded to my point on Jay Greene’s blog that it was important to actually read a school or district’s charter and not simply to assume that the language was about academic quality. Dr Ladner commented back with a drawing of someone wearing a Tin Foil hat. I am a lawyer. Charters are legal documents intended to bind people to a vision they might not appreciate and when I point out that factual concern, Dr Ladner’s response was that I must be a kook. No interest in facts. Likewise, the recommendations being pushed for K-12 education actually add up to Mind Arson given my knowledge of how they work as an avid amateur researcher with neither an education nor a political science degree like him. The legislators present at the breakfast would not know that, however. They were told x is a problem and y was the solution and that is what they will enact. The whole purpose of the public policy think tanks appears to be to control the narrative while politicians, blindly or not, adopt statutes that fit with all the details laid out in The Scientific Management of Society for the desired steering of people, places, and things. Is that why Jeb created FEE two years after he began the Bipartisan, supposedly ‘state-led’ process, that just happens to use K-12 education to impose “a programme for standardizing men’s behaviour”? The Atlas Network needed an affiliate at that precise time that would focus on the crucial Subjective Factor needed for social control under the old Soviet-created blueprints? In the last post I mentioned Boulding’s 5th grade Systems Analysis curriculum created in 1973 that “paves the way both for tighter scientific analysis of human and social behavior and for important moves in the direction of unified science.” Doesn’t that sound like Boulding and the Social Science Education Consortium sought to use the classroom in the US to also lay the groundwork for the Scientific Management of Society? A business that wanted to make a profit would be a ‘purposeful system’ then and a pond was the given example of parts that interact but “they do not interact together to achieve a common goal or purpose.” Now getting students to begin to analyze the world like this does a number of useful things for anyone wanting to encourage collectivism and social planning as a new norm. It focuses attention on dialectical processes so the student sees adaptation and change as normal and desirable. It creates the belief that people working together in any organization are not supposed to retain differing purposes or goals. By focusing the student on seeing a “city, for example, is not itself a goal-oriented supersystem,” the students are primed to believe that politicians will need to adopt goals on their behalf. To do that, of course, politicians will not have direct knowledge and will need to rely on public policy think tank employees to tell them what the goals should be and how to best enact them. See why WIOA requires systems thinking in all students to be workforce ready? If Upravleniye needs an alliance of government employees and non-governmental actors to push the vision of Scientific management of Society as the 1971 book said, don’t we now have the rationale for the sudden proliferation of public policy think tanks starting in the 1980s and in earnest since 1990? Telling teachers to raise the question with students of “what must the system ‘know’ if it wants to reach its goals effectively?” prepares students to believe that society and an economy can be successfully managed and should be. Telling them that people are poor because they ‘lack power’ and that “to bring about the desired result, the poor must communicate to the candidate that they are a bloc and that they have particular wants” encourages students to come to believe that all social and personal problems are solvable via political processes. Laying out classroom activities so that students will ‘relate system concepts’ directly to their daily lives really explains why people seem to have changed so much in what they can do and what they expect. It wasn’t accidental cultural change. With WIOA, ESSA, and Open Data Initiatives, we are all at risk of being governed in the sense sought by Soviet totalitarians unless we recognize how all these elements function together. These false narratives pushed in the name of ‘public policy’ have a common direction and it was laid out in 1971, originally in Russian. Please do not continue to fall for the conflicts of interest surrounding these think tanks and what they or their employees push. Better tell elected pols at all levels too where the phrase ‘the Governed’ really comes from as well. And it is not Our Founding Fathers being quoted. What was then at least understood by its dispensers as ‘depth psychology,’ and controversial enough to drive a bestselling tell-all explaining it, is precisely what is now known as Whole Child Education and Deep Learning. It must be used by teachers and principals, who may never have encountered anyone explaining the true background of these practices and techniques. Why? To be deemed Effective. This is why I created the term Inadvertent Change Agent in my book. It is also tied to what the new K-12 federal legislation, the Every Student Succeeds Act (ESSA), mandates as the means of establishing ‘success’. Good thing, huh, that systems thinkers specialize in a remaking of education and the creation of think tanks and a public policy network that will cause politicians to believe that they need to mandate and plan all these areas in the name of Equitable Economic Development? In fact, that is what the 2014 federal legislation–WIOA–now has all states and localities on record as planning. Since all the legislation to force the needed sociopolitical changes is now in place in the US, let’s go back to see what motivational research already knew in the 50s. After all the Congressionally created and White House visiting League of Innovative Schools was created to obtain desired research into what ‘motivates’ students. Boulding, in a 1973 paper he wrote for the Social Science Education Consortium, laid out his interest in viewing the “whole human being as a system” whose “concepts and perceptions are often strongly influenced by our motives.” Is it any wonder then that motives have been officially targeted for research and that ‘concepts and perceptions’ are officially required for annual assessment via ESSA? Vance Packard shorthanded Motivational Research and its goals and techniques as MR in his book The Hidden Persuaders so we will too as we access some of its insights as to why education is now taking the same techniques and forcing them deceitfully on classrooms and students everywhere. Packard quoted the magazine Advertising Age as stating the wide use of MR in politics–“This is all to the good.” What was not good, however, was the “growing public discussion of the importance of advertising in politics.” If public awareness that politicians were seeking to influence them emotionally and at subconscious and unconscious levels was problematic in the 50s, by all means let me continue to try to force a discussion of these same MR methods into K-12 education now. After all, if ‘role playing’ is a ‘psychological technique’ used to ‘modify the behavior and attitudes’ when it is used on ‘key personnel’ in large industrial organizations, it still has that same function when it becomes a required classroom practice for students. If an insurance exec admitted role playing was used widely because “we needed a motivational device…[that] at the same time teaches at the emotional level,” that remains true when the methods are transferred from adults to the far more malleable minds of students. When Packard quoted the book The Engineering of Consent on how the MR methods are of “considerable value…to those who wish to modify society” and that “People must be controlled by manipulating their [instincts and emotions] rather than by changing their reasonings,” we get to remember that quote when the Davos crowd suddenly this month calls for https://www.weforum.org/reports/new-vision-for-education-fostering-social-and-emotional-learning-through-technology . That’s even more true once we realize that MR users in the 50s knew already that “if you are engineering consent, then I think the social sciences would like to warn you that you should begin with a basic analysis of three levels upon which consent moves in a society like ours.” Try not to get ill when we recognize that education now is all about manipulating level two and public policy think tanks and many pundits from every spectrum and announced party affiliation are all about targeting level three. The man being quoted above and below is a social anthropologist Lyman Bryson describing 1953 seminars on the social sciences held at Teachers College, Columbia for PR firms. My bolding. Think of that quote and the ubiquity of the School Choice mantra that the think tanks push as their solution to education and the needs of public policy. Suddenly the imperviousness of the phrase to facts that show there is actually no choice becomes clearer. Likewise, Packard quoted a Dr Samuel Stouffer, director of Harvard’s Laboratory of Social Relations telling his listeners that “it was a good working rule that people’s attitudes are more easily reached through their emotions than through their intellects.” Back to role playing and a Whole Child emphasis and that Science of Virtues, then, huh? Federal law now requires, and states and schools, public and private, everywhere are happy to go along with, a now mandated invasion of the privacy of our minds. That’s the purpose of education research and the mandated databases. Longitudinal is another word for what used to be called more clearly ‘time series data’. The point is not what is personally identifiable, but the changes over time to allow this desired steering process. Packard was lucky. He was able to get the word out to enough people that MR became notorious. So it went underground and got new names and is now mandated for all of our children. To ultimately control enough of us for this steering to guide all institutions, but installed through deceitful false narratives and K-12 education. Person by person, starting with the children and euphemised as being about Learning, Student Growth, and Success for All. I have spent the last several days since President Obama signed the “bicameral and bipartisan” Every Student Succeeds Act (ESSA) on December 9 reading the false and misleading statements from various think tanks and reporters, supposedly representing a wide spectrum of political visions. Probably the most intrusive and impactful federal legislation ever and hardly anyone writing about it seems to feel compelled to actually read the legislation before explaining what it will do. In school a false Cliff Notes explanation of a book is likely to get a failing grade and an inquiry into cheating. In public policy and journalism now, creating false beliefs about transformative legislation seems to be all the rage. I guess it is to be expected that legislation seeking to physically reengineer the human psyche using behavioral science research would also use a bit of that research to create these false, or simply incomplete, talking points being used to describe the legislation. The reference to Orwell is not me being a clever wordsmith and trying to hype attention. There really was a conference in August 1984 (like his book title) in Cambridge, UK on George Orwell and the “potential for tyranny if the enterprise of politics is interpreted as being analogous to that of science.” I believe that is precisely what ESSA is designed to do. A huge number of reports I have read from the US as well as from all over the globe back that up. Recognizing that makes me want to at call attention to what is at risk and why it matters. This, I believe, is the true reason politicians of both parties and public policy types across the spectrum refuse to accurately describe ESSA. No one seems to want anyone to have much of a chance to recognize the purpose of all those euphemisms used in its language or the Red Herrings designed to be a cited focus. What does it mean if politics is being falsely analogized to science? Instead of politics being about competing interests within a set of rules that values the individual, scientizing politics uses education and the law as its primary tools. These allow coercive implementation without consent from those actually bound and treat politics as a truth-discovery process. What’s the truth to be compelled for belief? I have warned before that there really is such a thing in political science as the Human Development Society. Karl Marx wrote about it and all its tenets are being put into place now legislatively via all those unread, except by me, provisions of WIOA and ESSA. That is not an ideological smear, but a factual recognition of the background of these ideas. Whether widely known or not http://buildinitiative.org/Portals/0/Uploads/Documents/Four_Ovals_paper.pdf lays out the federal/states framework of using federal money to intervene in meeting ‘needs’ from birth on. The two think tanks, AEI and Brookings, have recently published definitive plans called “Opportunity, Responsibility, and Security: A Consensus Plan for Reducing Poverty and Restoring the American Dream” that would also please Uncle Karl immensely. Notice that as much as certain groups have capitalized on criticizing that video of Congressman Tim Ryan saying social and emotional learning is to be the primary focus now of education, that cited paper calls for the same focus. Since I have already read that paper, I know that it makes it clear that the primary reason to have funding follow the student and vary in amounts based on categories of ‘needs’ at federal and state levels is a desire to force socioeconomic integration on all public schools. I mentioned that goal last week at a program on Student-Based Budgeting and having it be portable like a backpack that was being put on by two Atlas Network members–the Reason Foundation and the Georgia Public Policy Foundation. Both acknowledged that was the goal, but it was a long way away. I pointed out that parents and taxpayers were not being told that was even the long-term goal in all the public programs around changing the nature of student funding. Following up on that discussion, I discovered that both Reason and the Cato Institute had published papers urging a shift in welfare policy to Universal Basic Income. In other words, the so-called Left and Right public policy makers seem to have agreed on implementing Uncle Karl’s vision with the only question marks being how much should be publicly provided vs merely publicly funded and provided under stipulated standards. Since that apparent reality would probably not be politically popular in a world where a majority of Americans do want to close the borders and not work as a beast of burden for everyone who can physically make it here and then start having children, we get the very lies and misstatements about WIOA and ESSA and what they are really intended to accomplish that I have been noticing. As always when confronted with any attempt to politically install a false picture of reality in the minds of boys and girls and the adults around them, I turned to a 1988 French book by Jean-Francois Revel that was translated into English in 1991 as The Flight from Truth. Revel noted just how unusual it is to find people “who possess a taste for facts and an interest in truth.” He called it the “anomaly of intellectual curiosity” and since I have definitely been driven by that curiosity all my life, his descriptions seemed like a good way to describe what ESSA, its required Higher Order Thinking Skills and Understandings (HOTS), the embedded Competency-based education, the required behaviorally-oriented performance standards and assessments, etc. are all hoping to foster in the minds and personalities of the students who will be tomorrow’s voters. “The power of ideology is rooted in a human lack of curiosity about facts. When a new piece of information reaches us, we react first by wondering if it is going to reinforce or weaken our habitual mode of thought…The ideas that interest us the most are not new ideas, they are ideas we are accustomed to. [or which preschool through higher ed intends to make us used to as Relevant, Engaging, and Culturally Responsive]. The prodigious progress of science since the seventeenth century prompts us to invest human nature with a congenital appetite for knowledge and an insatiable appetite for facts. The refusal to describe WIOA and the deliberate inaccuracies surrounding ESSA build on that recognized general indifference to knowledge most people possess. As Revel recognized and so does every behavioral scientist and educator seeking to ‘scientize politics’ in the 21st Century: “Man’s major foe is deep within him. But the enemy is no longer the same. Formerly it was ignorance; today it is falsehood.” Those mental systems that can induce calm or motivate action from a deep, emotional level must be created by education under ESSA in each and every student. Looking for that presence, and manipulating what is found as needed to create the desired dispositions and generalized knowledge and skills to be the future citizen a Human Development Society needs, is precisely what ESSA prescribes. It is what assessing for HOTS, personalized learning based on data, and ‘well-rounded learning experiences’ are all about. The entire concept of 21st Century Schools required to receive all that funding under ESSA goes back to another reason why education and the law are being used now to Scientize Politics without permission and with organized, active deceit from the public sector and its public policy advocates. We are being forcibly shifted from our historic emphasis in the West of a community organized around moral order to a moral community organized around shared common purposes. ESSA, WIOA, and those reports I provided as examples above, all assume a shift to an “overriding community interest” where everyone’s designated needs must be met. Individual rights to pursue our own interests and, apparently, our own knowledge of actual facts, get trumped by the desire to plan people, places, the economy, and supposedly ensure economic justice for all, regardless of background or personal productivity. Again, since being honest about this shift and a widespread recognition of what the consequences are likely to be is simply not good for a political career or even fundraising prospects for the typical think tank, we get lies and descriptions of legislation based on talking points with no actual curiosity for the facts. Education necessarily has to be altered at all levels to support this clear, but unheralded shift, because a society that locates its sources of social cohesion in moral community is “necessarily more vulnerable to shifts in attitudes and behavior patterns that might reflect individual departures from the shared purposes of the community.” At least we know now why a communitarian ethos and shared understandings just keep popping up in the required implementation of a Positive and Safe School Climate. As an anomalous seeker of facts with an insatiable curiosity about the likely effects in the reality where we all dwell, let me be the first to point out that this has historically been a tragic path for any society to actively cultivate. Just because our elected public officials have arrogantly voted to impose this vision on us using education and the law, with an assist on the falsehoods part from the media, doesn’t mean we have to acquiesce. The way out, as usual, is the recognition of what is really going on. Even is it is not a politically approved pathway anymore under federal law. The only good thing about the huge Every Student Succeeds Act (ESSA) dropped on Monday, November 30 that sailed through the House Wednesday evening, December 2, to move on to the Senate is that we finally have a truly fixed body of language to analyze. After writing my book Credentialed to Destroy: How and Why Education Became a Weapon back in 2012 examining the actual implementation and what its true effects would be, and now this blog dealing with real time subsequent confessions, I have joked that ESSA read to me as smoothly as if it were written in Latin and I was Cicero. The co-author of that report, Bethany Little, is a partner at the same Education Counsel that is tied to Clinton’s Ed Secretary Richard Riley. It was hired by the Common Core’s sponsor, CCSSO, to create the competency-based education successor for the Next Generation States pushing innovative practices. Not a surprise then to see that paying for Success or just Compliance with the same reading, civics, or math constructivism that political radicals who call themselves Social Reconstructionists have fought for decades to impose on K-12 (Chapters 2-4 of my book, which is how I recognized what ESSA described) features so prominently in what ESSA really forces. The local school district, charter school or any eligible entity, wanting those luscious federal dollars to flow to their local economy (think of students as just the excuse), agree to do whatever is specified. Is that really returning ‘control’ to the states and local schools with just federal ‘guardrails’? I know everyone reading will be shocked that this also fits with Intercultural obligations UNESCO adopted in 2004 and has now moved to force globally as part of its Rapprochement of Cultures decade and the initiatives from the last post. There goes the supposed ambiguity attached to complying with Part II’s obligations. How about Personalized Learning and that data obligation? That of course is where the true manipulation and reengineering of each student at a neurological level comes into play. I have written about this some and it is what my second book’s research covers in depth. Rand was also the chosen evaluator for the federally-financed Change Agent Study in the 70s that was used to create strategies for effective implementations of the behavioral sciences in schools going forward. I am sure none of their Effective Schools template is embodied in ESSA.That would be why the new chosen statutory phrase is ‘evidence-based.’ It is how the compliance of the local schools is to be judged. Literally as in “is the school or district providing programs, activities, and experiences that comply with these listed objectives for 21st Century Schools?” Compliance and greed is how the Social Reengineering gets forced with hardly anyone, I suppose, truly aware of what Congress is mandating. The real problem is the total reimagining of economies in the 21st Century by think tanks supposedly on the Right and Left, by governments at every level, and on a Bipartisan and Bicameral basis (as Congress is describing its support for both ESSA and 2014’s related WIOA (see tag)). In a 2014 report called “Impact Investment: the Invisible Heart of Markets” the true vision of the 21st century global economy is laid out. This is what both WIOA and ESSA (as well as other legislation and programs) intend to quietly force on the US. It is to be quite lucrative as well for the insiders, foundations, and investment banks cited in the report. Would anyone be shocked to know Gates and Soros are both involved and all the UN entities and the OECD? It would also go well with a forced community cohesion mandate a la UK or all the communitarian obligations in Positive School Climate and Democratic Education too. There is a lot of information in this post so let me close with another document that came out today as the UN announced a “Global Alliance to Monitor Learning.” Interesting timing, huh? With ESSA just passing the House, but there is a mention of A4L. Not a lot of new acronyms in my world at this point, but that was one. When I looked it up http://www.uis.unesco.org/Education/Documents/assessment-for-learning.pdf , it showed me a Theory of Change that fits completely with what ESSA has just set up to send money to local communities in return for compliance with the UNESCO vision. The one no one locally has to even now about. Quality Learning for all children and youth turns out to be first about Activities, then Intermediate Outcomes, Outcomes, and finally Impact. All in a document tied to the Brookings Institute and its sunsetting Learning Metrics Task Force. I wrote about LMTF and its use of Competencies and the nice Rockefeller Foundation letting them use its Bellagio retreat. That would be the same foundation that coined the very term ‘impact investment’ back in 2007. How coincidental, huh? Behind a push globally along with others about using tax dollars to force “measurable social outcomes” including reengineered human personalities. Each to be primed and motivated for fundamentally transforming existing social, political, and economic structures. I was a history major and I recognize a variant of Mussolini’s infamous definition of Fascism, even if the State force is divvied up at multiple levels from the global to the local all the way to an insistence on student-centered learning: “All within the State, Nothing outside the State, Nothing against the State.” Remember authoritarianism is not rejected, just any perception of a top-down, centralized imposition. When I found that Lifelong Learning Technical Paper, it revealed a supposedly binding set of documents from 2013 called the “Beijing Declaration on Building Learning Cities” and ” Key Features of Learning Cities.” Locating these and reading through them it became apparent that I had been living through and attending meetings clearly implementing this Learning Region agenda. No wonder I accidentally learned so much as my book pulled together in alarming detail. I now know that for sure and not just by inference because a few days ago the San Francisco region issued what it called the Roadmap http://www.bayareaeconomy.org/report/a-roadmap-for-economic-resilience/ that fits with every tenet aspiration of a UN Learning Region down to wanting to create a public-private partnership of elected officials and civic and business leaders to guide an Economic Development partnership that would be qualified to access federal funds as one of the 380 duly-qualified Economic Development Districts. Lots to build Learning Cities and regions on, huh? The report thanked those that have gone before and listed Atlanta, Chicago, Seattle, DC, and Los Angeles. Between the last post and this one I went out of town and part of that trip involved driving Interstate 75 through Dalton, a reminder of the Aspen/fed Communities that Work Partnership http://www.aspenwsi.org/communities-that-work/overview/ that just commenced. WSI is Workforce Strategies Initiatives because in Learning Cities and Learning Regions, we all know that K-12=Workforce Development=Economic Development=Living itself under that definition of Lifelong Learning. Get enough physically juxtaposed regions and cities in one federal program or another, including Community Broadband that the close-by Chattanooga just issued bonds to finance, and our Learning Regions start knitting into a Learning Society committed via the law and education to Lifelong Learning–everyone, everywhere, all the time. Quickly as I am running out of time, at the end of September 2015 a Second Learning Cities Summit was held in Mexico City and it set out the above as Guiding Documents for cities and regions to formally join the UNESCO Global Network of Learning Cities. Maybe our mayors or city council members do not plan to tell us though and simply go to conferences like PolicyLink’s October Equity Summit in Los Angeles where the principles are all asserted with federal officials mixing with local and with community organizers, implementing a global agenda without telling us officially. Maybe the recognition comes from something like an ASCD Whole School Whole Community Whole Child Poster http://www.ascd.org/programs/learning-and-health/wscc-model.aspx once we know about the Lifelong Learning/Learning Region formal agenda and seeing how it fits like a jigsaw piece to a puzzle. When we read about “more collaboration and partnerships with families, industry and business, voluntary associations, people active in cultural life are needed,” we need to recognize this is not just some random public spiritedness and desire for collaboration. It derives from official global policy for a new kind of cultural model internalized within the mind and personality. We will close with the aspiration laid out by the Chinese Vice Premier at the 2010 Shanghai World Expo that this UNESCO agenda of Lifelong Learning is to “facilitate the comprehensive and personalized development of each and every individual.” Now take the top-down authoritarianism rejection and marry it with the bottoms up intent of Human Rights Education. This is Part 2 of a Trilogy, remember? Now would be a good time to remember it does not say Economic prosperity. It would also be a good time to remember that new definition of Culture the Cognitive Anthropologists created set out above.